Language Log » Great but not good? "Put a pulse to the hooter"
These days you'd just have the program write out status updates, I guess. When we switched to a PDP-11, whose console was less informative and also was in another room, someone arranged to place two cables next to each other — one of them connected the computer to the external disk drive (a machine about the size of a washing-machine that could store a full 1.5 megabytes), and the other one provided input to an amplifier connected to the audio output system. Through the magic of electromagnetic induction, we could then hear variable-rate clicking and chittering and humming as the machine went through various stages of a process. Back in the 1970s I worked in a lab where we had individual computers (the size of a hotel minibar) that used 15" removable disk packs (about the capacity of a 3" floppy). Running a software build on these machines could take upwards of 20 minutes, but I soon learned to recognize when the build was almost done by the distinctive pattern of audible disk seeks as it wrote out the final executable. I love this! now we know what hooters can really do. Back when I was learning to build hardware (6502 cpu in the late 70's), we put a radio near the memory card and listened. The particular loop that we suffered from most frequently – if I can remember back that far – was a bug leading to an interrupt being called and the 6502 fetching the interrupt handler from high memory somewhere. The sounds the radio would spit out were quite identifiable when this was happening. While I'm struggling to remember the physical details of what was going on, the visceral feel of it came rushing back to me on reading that quote. It's interesting that English has no common, standard equivalent to "visualize" for audio. Converting data to an audio format in order to harness our (extremely sensitive) sound perception circuitry is fairly rare (and perhaps underutilized), but not so rare that it doesn't deserve a name. equivalent to "visualize" for audio. We have "vocalise" and "verbalise". As others above reminisce, yes back when I was a computer operator, I got to know the audio pattern of the 'nightly batch run'. I don't know if manufacturers deliberately put sound effects into their machines as per Turing, but they certainly didn't noise-suppress them. And Turing's 'hooter' persists to this day as ASCII 'Bell' ctrl-G.
"That was a great idea, but I don’t think it was really a very good idea." The text seems like a verbatim and untidied record of what was actually said (see also "A hooter is an English, in England is a loudspeaker"). By "that was a great idea" I think CS was saying Turing had a great flash of inspiration aimed at filling a need. But by "I don’t think it was really a very good idea" I am guessing he meant that the detailed practicalities of learning to listen to these sounds and derive information from them might prove hard for the average user who is not-Turing, and a better way (like lights) would be preferable. Either that, or he was just complaining that implementing this hooter system universally would make for unfeasibly noisy computer labs, honking and tooting and parping all the time. If he had written the piece, perhaps he would have recast the phrase differently. Those of a certain age (and nerdiness) would know why it was there. Besides writing programs to play "music" by picking up the variations in RF from, e.g. different length "Move" instruction, our most popular use was to stay in the room next to the computer room (which was kept at a temperature more comfortable for computers, or polar bears, than people), and listen to the radio. When the distinctive sound of the "waiting for a command" prompt was heard, it was time to put on the parka and go in to start the next job. Back in the '80s in BASIC on the Atari 8-bit computers, I'd use short sound synthesizer commands for debugging the same way: There was no console or other way to see something happening, but at least one sound channel was usually free. It could be as simple as "sound 3,x,10,8" for a tone based on some data. Later I'd go through and delete all the sound 3 commands. Now doing that is improbably difficult, making a waveform and playing it takes at least a utility library, or playing back a sound file. I just log text to a console. So that's another kind of linguistics: The words you have easy access to are the ones you use. The modem we used to dial the ISPs would have beep and boop and brappp depending on the connection speed. Back in the old days, this could have worked pretty well, but as CPU speed went up, it would have gone out of the range of hearing. Thankfully, by then we had logic analyzers and digital oscilloscopes to help with problems of that nature. 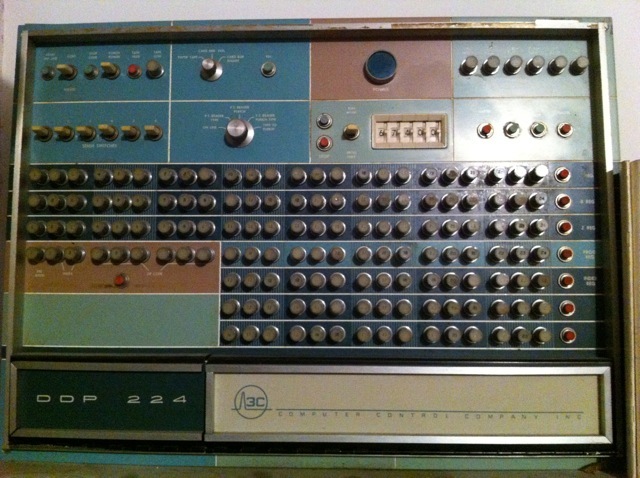 I worked as a computer operator during university vacations in the 1960s on ICL 1900 series computers, and they all had a coil somewhere near the processor connected to a small loudspeaker in the operator's console. Many tasks such as payroll ran for hours with frequent changes of tapes, and we all knew from the sounds when a tape change was coming up or when the task was about to complete. As many have noted, diagnosing computer troubles by sound was and still is common. So dismissing the idea may have been premature. Oh, and in the phrase 'put a pulse to the hooter' it's the 'put' that is really the strangest – it is rarely ever used in that sense. I wonder if in the computer use it was regarded as a clipping of 'output', or at least influenced by it?